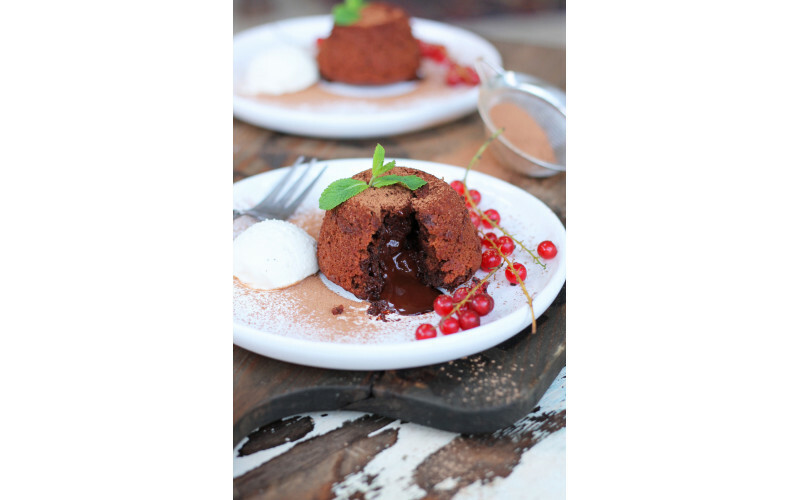 These fondants are a real crowd pleaser and make the perfect dinner party dessert. To be honest you can eat them with just about any meal but if you want to impress then they really have the wow factor! They are surprisingly quick and easy to make which is a definite bonus! Taken straight from our lovely Winter Wonderland recipe guide... over 25 recipes of delicious seasonal comfort food, only £3. Pre-heat the oven to 180˚/350˚F/Gas Mark 4. Grease 4 pudding basins (buy from supermarkets with a home section, kitchen shops and online) and set aside. Place all of the wet ingredients into a saucepan and gently heat on a low-medium heat, stirring until melted and blended. In a large mixing bowl, sieve the flour and add all of the dry ingredients, stirring until thoroughly combined. Fill the pudding basins with the mixture until three quarters full. Push 5-6 pieces of chocolate into the middle of each of the basins until they are fully submerged into the mixture. Place the basins on a baking tray and bake in the oven for 12-15 minutes. Sprinkle with cacao and serve hot with ice cream and berries.